The BASI Level 2 is a gateway qualification which allows you to work in a mountain environment. It s recognised all over the globe and is a the next step in building a career as a ski instructor. Here’s a breakdown of what to expect. 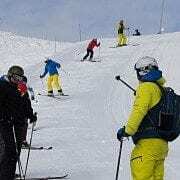 Before you start your BASI Level 2 qualification, BASI recommend that “you should be able to ski to a competent level, and have the knowledge, ability and understanding to safely teach alpine skiing up to and including parallel standard on marked pistes“. If you’re not sure you’re at the level, join us and find out! We run Open Days in the UK throughout the summer, where one of our trainers will ski with you for free and make sure you’re on track. The exam itself is 10 days in total: 5 days on snow, 2 days off and another 5 days on. The are assessed continually throughout the course, meaning you are not expected to be perfect throughout the entire exam. In the first week, you will be learning a lot of new terminology, and will be working on getting your skiing to the required level. At the end of the first 5 days, the trainer will provide you with an action plan for the next week. This will specify the aspects of the exam you need to work on, and provide you with a focus going into the second week. After the break, the trainer will expect to see you improve with their feedback, refine your technique and ski consistently to the level. You’ll also be asked to run several teaching sessions throughout the 10 days. From 9am – 2pm, you’ll be on the snow learning and demonstrating, with a short break for lunch. 2pm – 5pm is classroom based, meaning you’ll look at the provided course materials, the BASI manual and videos of your skiing. This allows you to focus on teaching styles, ski terminology and breaking down the technical aspects of skiing. Delivery / Safety – be able to run an enjoyable, safe and achievable lesson for the clients using the TIED model. Concepts such as the Central Theme, Fundamental Elements and the TIED model will have been explained to you during the Level 1 exam, but they will be revised in the classroom sessions. For more details, please visit the BASI website. You will probably note that the BASI Level 2 exam is focused more on the technical aspects of skiing. Therefore it’s really important you make sure you’re at the required level before attempting the exam, or undertake specific training, such as our BASI Level 2 Preparation course. You’ll be asked to teach your fellow students. As the exam assesses two separate strands (teaching and technical skiing), it is possible to pass one and fail the other. In this case, you must take a 5 day resit (within 2 years) to show you have reached the level. If you are unable to pass both strands, you are required to take the full exam again once you are ready. The BASI trainer will ask you to change aspects of your skiing, and they are looking for you to demonstrate those changes. Even if they feel weird, go with it and do your best. Changing your skiing always feels odd at first! Sometimes the BASI trainer will ask you to go beyond the above criteria. Even if you reach the level, they will always do their best to improve your skiing. It’s a good thing! We recommend taking a full rest day during the break, and one day working on aspects of the exam you need practice in. You could even have a private lesson with a BASI qualified instructor to focus your training. Do everything you can to improve your chances of passing. Try to maintain an active lifestyle prior to the course – they are long days and fitness makes a difference. Things like spending time studying the manual, planning your lessons and eating well go a long way too. Want to take your Level 2 but need a little extra push? Why not join us for two weeks of training before the exam. Our Fast Track programme is at the perfect time to get you qualified early in the season.